Filled with spices, super fluffy & perfectly moist – these easy Gingerbread Pancakes are the ultimate breakfast for the holidays! Where did December go? I’ve been running around doing Christmas errands and hanging out in the kitchen surrounded by a haze of icing sugar – and now somehow it’s only a few days until Santa comes. I still have about 50 recipes I wanted to try, all my presents to wrap – and a few last shopping trips and grocery runs. To everyone out there who writes Christmas cards – please tell me your organization secrets. 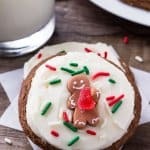 So, if you feel like you’ve been in a whirl of holiday activities – or even if you haven’t – I highly recommend taking a morning (or at least an hour) to relax & eat these gingerbread pancakes. Turn off your phone, pour yourself a large coffee & indulge in fluffy, cinnamon filled, super moist gingerbread pancakes. Drenched in maple syrup of course. 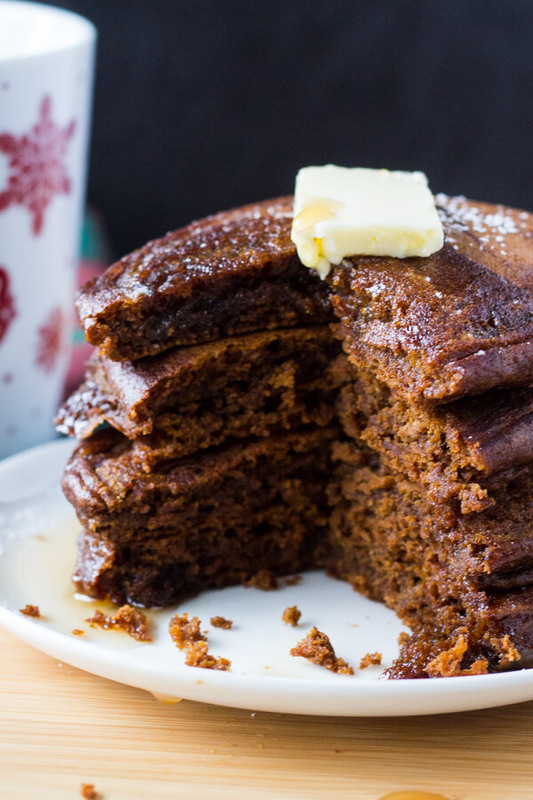 These pancakes have all the flavor and delicious qualities of a warm gingerbread cake. 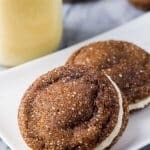 They’re filled with spices, have a rich molasses & caramel flavor, are oh so moist & completely comforting. But since they’re in pancake for – they’re also super fluffy, ready in minutes & approved for eating at breakfast time. What makes these Gingerbread Pancakes so Delicious? For the gingerbread flavor we’re using ginger, cinnamon, nutmeg & cloves; brown sugar for a caramel undertone; and of course molasses. I’d recommend using light or dark – but not blackstrap since it can be overwhelming. You can use 2-3 tablespoons of molasses depending on how rich of a gingerbread flavor you like. I ended up being a little heavy handed and mine had closer to about 3.5 tablespoons. If you’re serving them to children – I’d probably use 2 tablespoons. Then for the fluffy delicious pancake qualities. In this recipe, we’re using buttermilk because it creates the fluffiest, softest pancake crumb. If you don’t have buttermilk you can make your own with vinegar and milk (see recipe notes) – but I’d definitely opt for the real deal if possible. 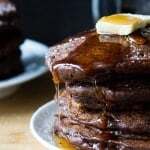 You can use between 3/4 cup and 1 cup milk depending on how thick you like your pancakes – I used exactly 3/4 cup and my batter was very thick – which gave me super tall & fluffy pancakes perfect for stacking. As always with making pancakes – having your milk, egg & melted butter at room temperature makes it easy to incorporate all your ingredients without over mixing. When you fold your wet ingredients into your dry, use a large rubber spatula or wooden spoon and only mix until almost combined. This keeps your pancakes fluffy and ensures that they aren’t tough. A few flour lumps are A OK! 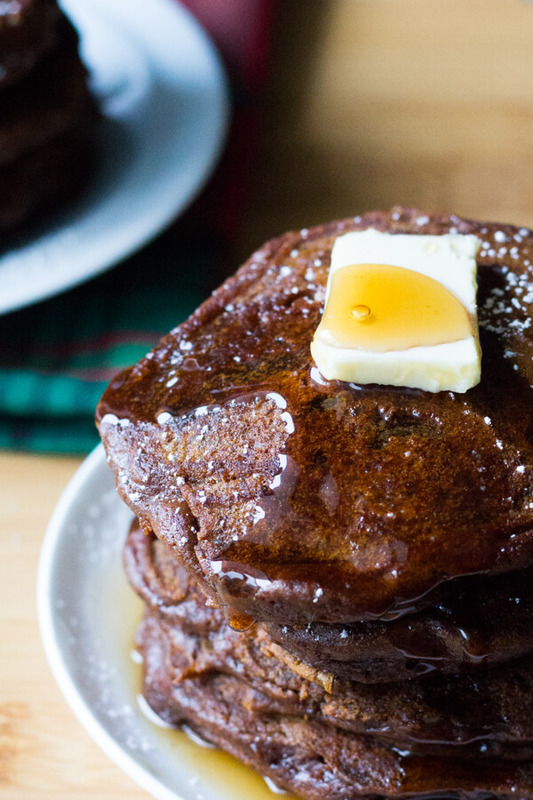 These gingerbread pancakes are the perfect breakfast for family visits, a relaxing morning by the fire, or fuel for all your last minute Christmas errands. Warm gingerbread in pancake form – pure Christmas bliss! In a large bowl whisk together the first 9 ingredients - from the flour through to the salt. Set aside. In a separate medium sized bowl, whisk together the remaining ingredients (melted butter through to the vanilla) - using 3/4 cup to 1 cup of buttermilk depending on how thick you like your pancakes. Pour the wet ingredients into the flour mixture and fold together using a rubber spatula or wooden spoon until the batter is mixed but some flour streaks can still remain. Preheat an electric griddle to 350F degrees or heat a large frying pan on the stove to medium heat. Grease lightly with oil or non-stick cooking spray. Pour the batter onto the griddle or frying pan in about 1/4 cup measurements. Allow to cook for about 3 minutes on the first side. Once you see small air bubbles forming on the uncooked side, flip the pancakes over and cook on the remaining side for 2-3 minutes until both sides are golden brown. Repeat with the remaining batter. Had these for breakfast this morning. they were really great and got me in the festive mood. So glad to hear – I hope you had a very Merry Christmas!